Way back in 1993, in a development of which a young the Informer was blissfully unaware, the world’s first GSM1800 network was launched in the UK under the moniker Mercury One2One. Half a year later, it was joined by a new company called Orange. Each was to make its mark. The two were given the remit of expanding mobile service to the UK’s mass market, and they opted to go about it in very different ways. One2One opted for cheap and cheerful, with what turned out to be something of a misjudged attempt to appeal to the hoi polloi. The firm offered free calls every evening and all weekend. While this did win it the (slightly incredulous) patronage of quite a few Brits, it proved economically unsustainable and the firm tried to snuff the deal out. Famously, original contracts that remained tied to the deal changed hands for thousands of pounds on the black market. Orange headed in the opposite direction, launching a brand that was genuinely groundbreaking in the mobile industry and beyond. It’s fair to say that many of the leading brands in the mobile carrier space today owe a debt to the spadework put in by Hans Snook and his launch team. As 2003 gave way to 2004, Orange (now owned by France Telecom) ceded leadership in the UK market to T-Mobile (which had bought One2One) and the mass market remit of the original licensees appeared to have been met. Times change, though, and the two carriers this week announced their plan to merge, ending months of speculation over the future of T-Mobile UK, which had been attracting the interest of all of its domestic competitors. Today Teléfonica’s O2 dominates the UK mobile market with almost 23 million subscribers in August, according to Informa’s WCIS database. Orange, T-Mobile and Vodafone cluster behind it, all with around 16.5 million users. The merger of the German and French operators would catapult the new firm to an unassailable lead, with more than 33 million subscribers. It’s the kind of boost that Nicolas Sarkozy can only dream about when he’s buying his little shoes. The deal would require the approval of the competition authorities but, while the new carrier would have a big lead in the market, O2, Vodafone and 3UK might not have cause for complaint. Reducing the number of carriers in the market could ease intense price competition and while the newly merged player ponders its new brand-plans call for the two existing brands to be maintained for 18 months while their respective navels are thoroughly gazed-the rest of the players could exploit their entrenched positions. This would certainly give Ashish Chowdary, who has benefited from the departure of Simon Beresford-Wylie from NSN, something to think about, as he will step up to head the services business when incumbent Rajeev Suri becomes CEO at the beginning of next month. Back to the carriers, though, and Teléfonica was this week focused on a deal many miles from its UK outpost, as its relationship with China Unicom moved to third base. The two firms have struck a deal that will see each invest $1bn in the other. This will raise the Spanish incumbent’s existing stake in Unicom (a result of its share in China Netcom, which Unicom was instructed to absorb by the Chinese government last year) from 5.4 per cent to eight per cent. Unicom, meanwhile, will become the proud owner of 0.9 per cent of Teléfonica. Between them the firms have more than half a billion customers across Europe, China and Latin America. They’ve committed to co-operation in a number of areas, including infrastructure and handset procurement, wireless service platform development, enterprise solutions for large multinationals, general R&D, roaming, some unspecified strategic initiatives and an exchange programme for employees. The move pits Teléfonica against Vodafone, which holds a few per cent of China Mobile, in the global investment wars. Also pushing into China this week were people at the Symbian Foundation. The OS group has announced a programme with China Mobile that will see the two organisations join forces on a range of projects, including the development of Symbian handsets based on the Chinese 3G variant TD-SCDMA. The Foundation will also be working to drive application development for the world’s largest carrier’s app store, part of the Joint Innovation Lab project run by China Mobile with Vodafone, NTT DoCoMo and Softbank. One application developer that is apparently not too bothered about Symbian is music streaming outfit Spotify. The firm unveiled its mobile offering this week, with applications for the iPhone and for the Android operating system. For Symbian S60, though, there was only a demo available. The mobile version of the popular online service will be available only as a premium product, costing £9.99/month. In this format, the audio adverts that enable Spotify to offer the service gratis online are stripped out. “We still have a fair bit of work to do before we can release it,” Spotify said of the Symbian version. That a firm like Spotify should prioritise Apple and Android over the bigger installed base of Symbian gives an interesting insight into how developers see the OS battle shaping out. But the fact that the firm has been forced to return to its invite only subscription model for free accounts “due to overwhelming demand on mobile” suggests it’s a bet that’s paying off. We know how Motorola sees the OS battle shaping out, because it has pledged its allegiance to Android. This week it unveiled its first Android phone, not branded as Sholes, as we had been led to expect, but dubbed instead the Cliq in the US and the Dext elsewhere. A clique, of course, is a small group of people. Let’s hope this doesn’t prove to be the market for a phone thus named. As is the trend among most vendors that have adopted the Android platform, Motorola has encased the OS with its own sheath and developed an interface known as MotoBlur, that supplies a number of functions. The first of these is the integration of social networking and communication, with MotoBlur streaming together posts, messages and photos from different sources including Facebook, Twitter, MySpace, Gmail, and other email. All of this info is pulled onto the homescreen via the magic of widgets and, like Apple and Palm, Motorola is also making use of the cloud to allow backup and syncing of data and contacts over the internet. 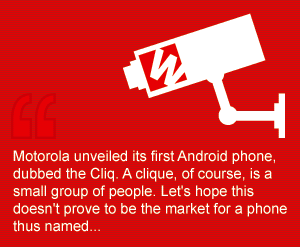 The Cliq will be available exclusively via Android fan T-Mobile USA in the US in time for Christmas. Under the name of Dext, the device will also be available with Orange in the UK and France, Telefonica in Spain and America Movil in Latin America. None of the operators have yet revealed pricing or tariffs for the device. Motorola will be playing catch-up to Android specialist HTC, which revealed its new mass market device on the Google-backed OS, dubbed the Tattoo. In the Informer’s experience lots of people regret getting tattoos, and HTC will be hoping the stigma of a foolish, juvenile purchase that comes back to haunt you when you’ve grown up a bit will not be attached to its new phone. The Tattoo is the second phone to use HTC’s in house designed Sense interface, the first being the Hero. Buyers of the phone will be able to design and purchase their own unique handset covers to alter its physical appearance as well. The Informer will go for one that has MUM written on the front and DAD written on the back. Or perhaps LOVE and HATE. Yes, where would we be without the Rabbit!